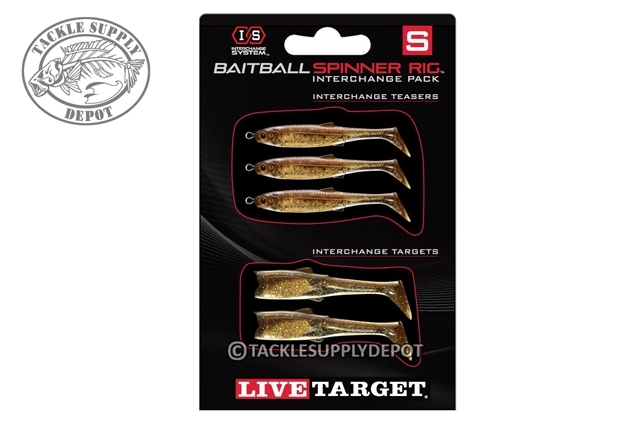 Customize or refresh your LIVETARGET BaitBall Spinner Rig with the LIVETARGET BaitBall Spinner Rig Interchange Pack. The Interchange system makes it convenient to create your own color patterns and replace bodies. Each Interchange Pack contains three Teasers and two Targets. Select the Interchange System that matches your Spinner Rig frame size as noted by the red square size symbol: S, M, L on the package. This insures the replacement fish match the original frame.